Combarro is a traditional restaurant offering Seafood cuisine. The average price of a main course dish at the Combarro restaurant is 25 euros. The average price of a 3-course meal at the Combarro restaurant is 65 euros. Note that although GoMadrid.com strives to maintain all information about Combarro up to date, the prices mentioned are only an indication and may not reflect the exact value of your meal. Classic decor on the outside with modern interior decorated with antiques. Private dining rooms and a shellfish tank inside the restaurant plus a bar for tapas and aperitifs. A valet parking service is available and contributes to the exclusive atmosphere. Excellent Madrid cuisine with several gastronomical awards, including: Premio de Calidad (quality-award), Medalla Mérito Turístico Xunta de Galicia (recognition as tourist attraction), Percebe de Oro, Gran Collar Gastronómico Internacional, etc. 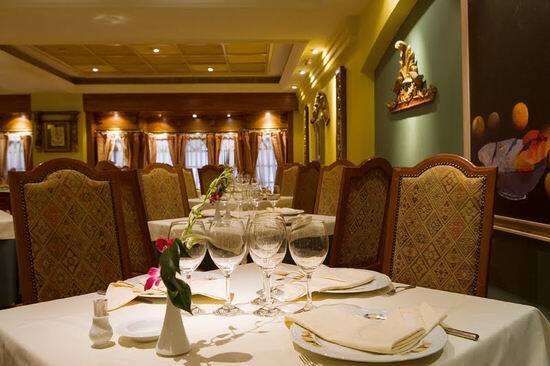 The address of the Combarro restaurant is: Reina Mercedes, 12, 28020 Madrid. The nearest Metro station is Alvarado. Please see the Combarro restaurant location map below.